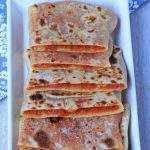 Gozleme has been in my bookmark list for almost more than 2 years. Ever since I first read this recipe, I had always wanted to make it, but it kept slipping out and I could not make it until now. 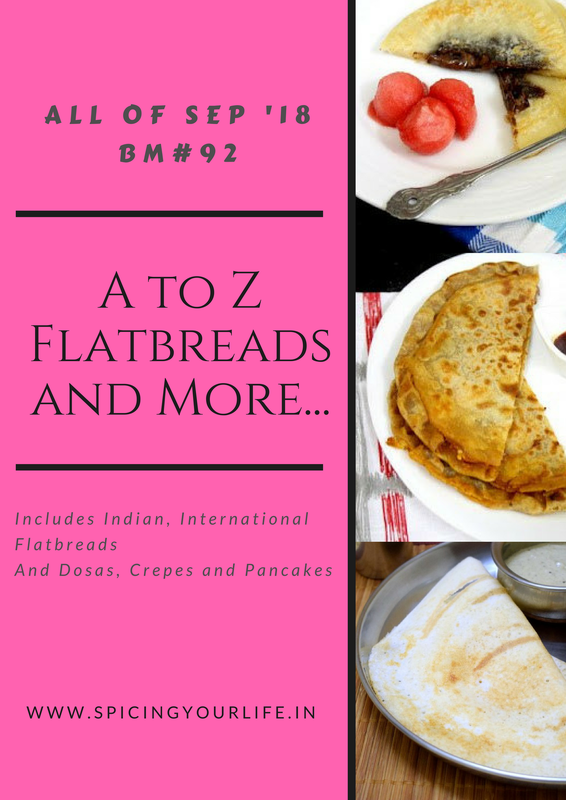 It is the end of our first week of A to Z International flatbread series and I have this delicious Turkish Gozleme for the letter ‘G’. 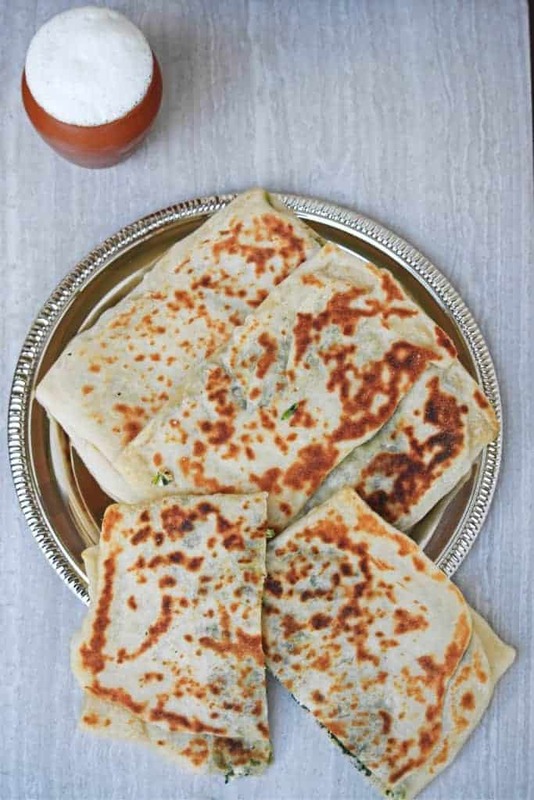 Gozleme is a very popular street food in Turkey and can be made with a variety of filling. The fillings can be either sweet or savory and there are several different savory versions. 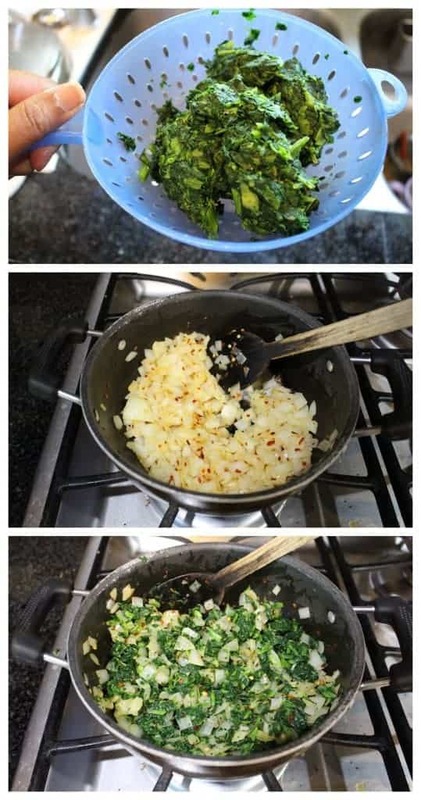 The filling can be anywhere between potato to herbs to just cheese to this spinach and cheese. 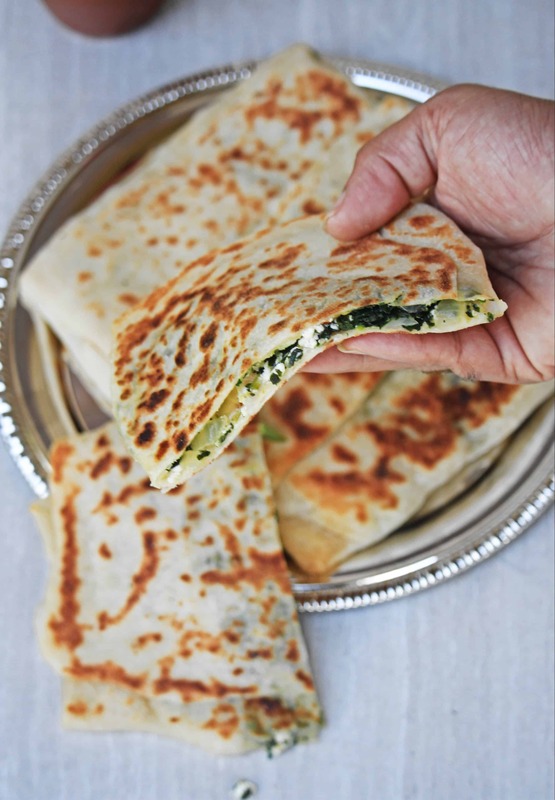 The spinach and cheese combination is very popular in the Turkish cuisine and can be seen as a filling for several other recipes like this Turkish Cigar Pastry. The dough for the Gozleme is pretty easy and made with just the basic flour and yeast. There is also a little bit of yogurt to give it that tangy flavor, but if you prefer, it can be skipped. The fun of making the Gozleme is in the rolling part. The dough has to be rolled / stretched pretty thin to have a good ratio of the dough to the filling. 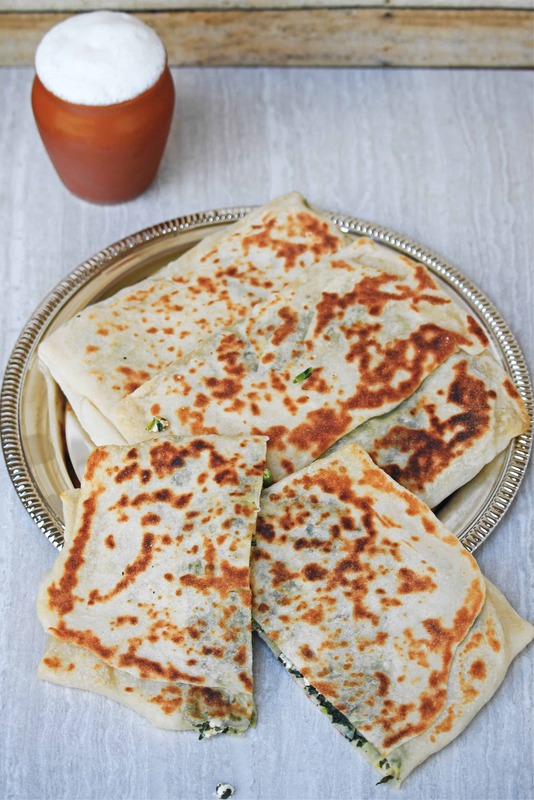 If the dough is rolled too thick, the Gozleme will feel a mouthful with a very doughy feel. The rolling comes with practice and I pretty much was able to get a very thin stretched dough by my third ball of dough. I used a imported good quality of sheep’s milk Feta and it had a very strong flavor. I am not a big feta fan and when making it otherwise, would happily swap it with another less stronger flavor cheese. My boys and my husband though like feta cheese and to keep their taste buds happy, I use feta quite often. I have mentioned not to use salt in the filling as my feta cheese was very salty. Taste your cheese before adding salt to the filling. I followed the folding technique mentioned in the Ozlem’s Turkish Table recipe. This is one of my favorite website to refer to when making Turkish food. I have tried my best to capture the rolling technique for better understanding. I made the dough in my stand mixer. In the bowl of the mixer, add the flour and salt and mix to combine. In a measuring cup, heat about 1 cup of water. Add the active dry yeast and sugar to the water and mix well. Cover the cup and let the yeast proof for about 10 minutes. 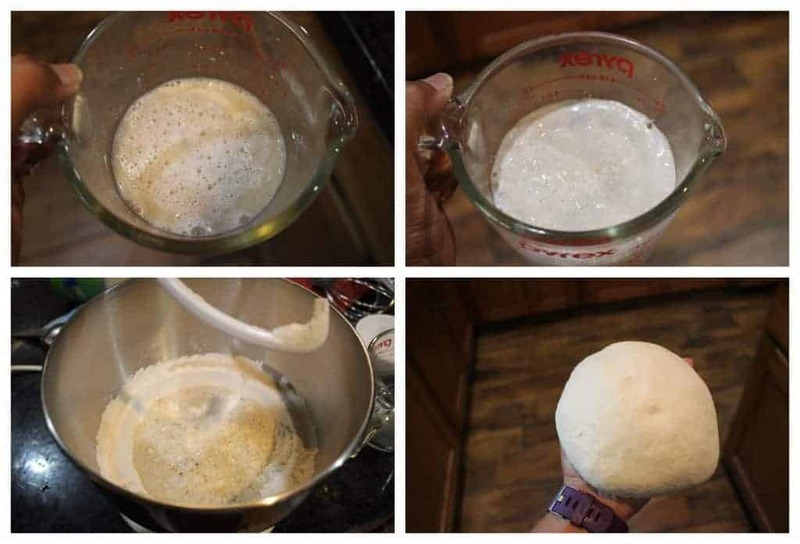 The yeast would be bubbly and foamy at the end of 10 minutes. If the yeast does not appear foamy, then the yeast might be dead and you have to start with a new batch. Add the yogurt and the yeast mixture to the bowl along with the olive oil and start mixing. Add more water if needed to make a very soft dough. The dough would be very soft but not sticky. 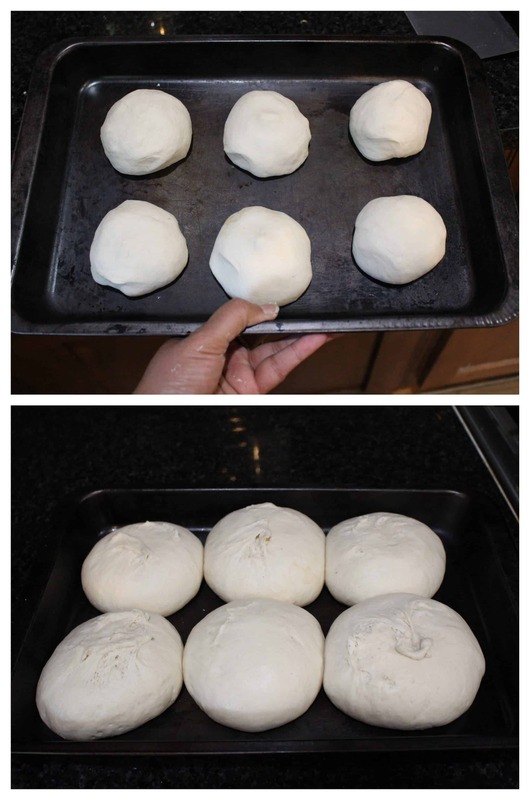 Dived the dough into 6 equal pieces and make a smooth ball. 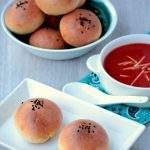 Place the dough balls on a greased tray, well spaced and cover with a plastic wrap. Let the dough rise for about 30 minutes to an hour or until it has doubled in size. I used frozen chopped spinach to make the filling.for the Gozleme. In a microwave safe bowl, place the spinach and thaw it in the microwave according to the instructions on the microwave. Squeeze all the extra water out of the thawed spinach and keep it aside. Heat oil in a pan and once it heats up, add the chopped onion. Let the onion cook a bit. Add the crushed red pepper to the onions and let it cook for couple of minutes more. Do not let the onions caramelize too much. Just cook until they are soft and translucent. Add the prepared spinach to the pan and mix well to combine. Cook for couple of minutes more for flavors to combine. DO NOT ADD SALT. The Feta cheese has a lot of salt and that was just enough for the filling. Also taste the cheese and then decide if you need any extra salt. Let the spinach onion mixture cool down to room temperature and then add the crumbled feta to the mixture. Mix well to evenly combine. Once the dough has risen, take one piece of dough and place it on a well floured surface. 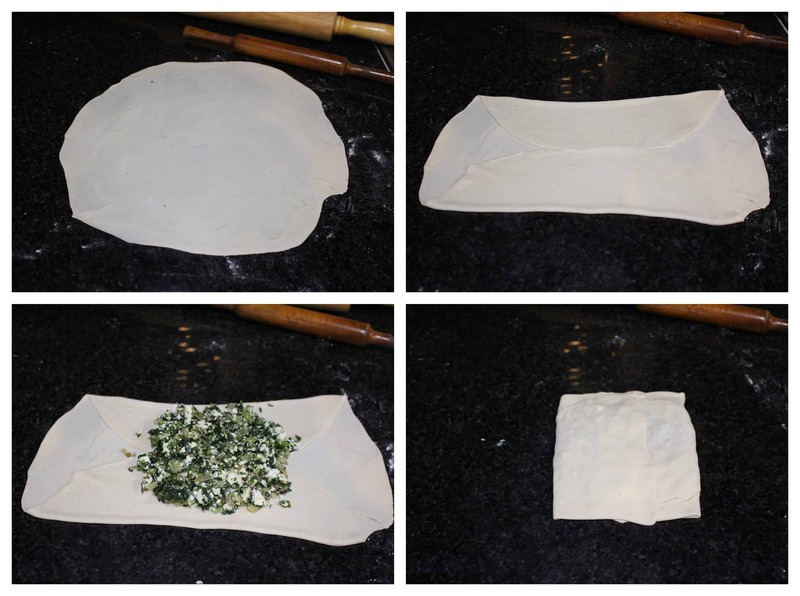 Start rolling the dough to form a large circle which is very very thin. Make sure that you roll the dough very thin or else the Gozleme will feel very doughy. Fold two opposite sides of the dough towards the center. Divide the filling into 6 equal parts. Place one part of the filling in the center of the dough. Refer to the picture below to understand the folding technique. Now fold the other two opposite sides over the filling towards the center, overlapping and seal the edges well. Heat a heavy skillet / pan on medium high heat. Brush the prepared gozleme dough with olive oil and place it on the hot pan, oiled side down. Cook on medium heat until golden brown and then flip to the other side. Before flipping, brush this side with oil as well. Cook on both the side until golden brown. Make sure that the heat is on low to medium to allow the Gozleme to cook all the way through. 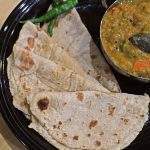 If cooked on too high heat, the outside will cook quicker and the interior will still remain very doughy. Slice into 2 or 4 pieces and serve warm. I have no choice but to drool , seriously this is the second Gozleme in a row ! The feta and spinach is a lovely combo and I agree due to high salt in feta and even spinach one should be careful while making this stuffing . The gozleme looks fabulous! The spinach and feta filling must have been delicious…awesome pick!! How fabulous this Gozleme looks especially am in love with this green and cheese filling. 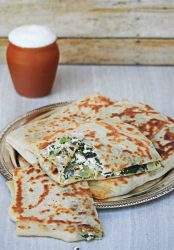 Have tried Gozleme with a different filling yet this spinach and feta stuffing tempts me a lot. 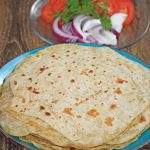 You rolled them prefectly Sandhya. Excellent choice Sandhya. The bread has been stretched really very thin. Perfectly made. I hate store bought feta because of its saltiness. But I do love the home made version with very little salt. Feta and spinach are such a great combo together and in this bread, it sounds so yum. 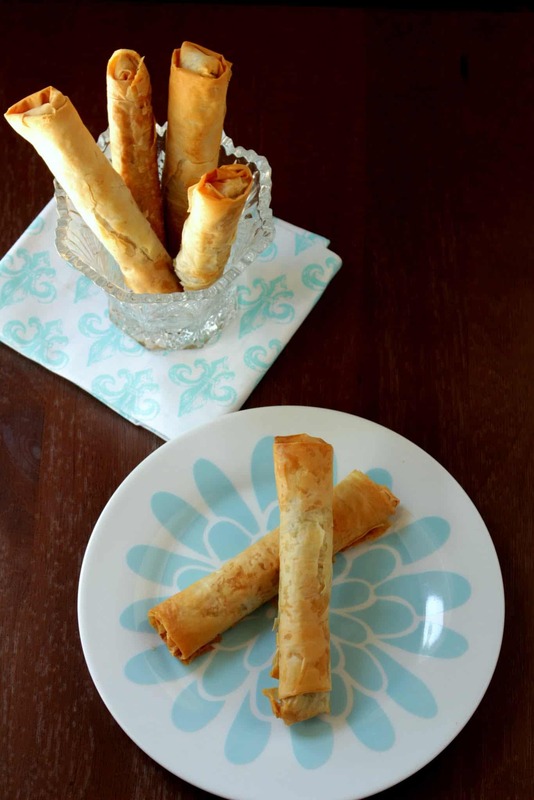 The technique of rolling is so much like filo pastry. You have made it perfectly thin Sandhya. 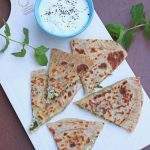 I love feta, I love crispy breads so I still don’t know why I’ve not made this flatbread as yet. Yours with spinach and cheese filling looks very tempting and perfect. Glozleme looks delicious. The filling definitely must have given an awesome taste. amazing, filling using feta cheese surely making it a great flatbread. Filling itself looking mouthwatering. Great share must say. 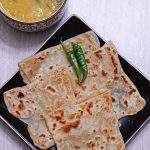 Your Gozleme has turned out simply too good Sandhya. I enjoyed it so much when I had made for the previous edition. I found the feta that we got here was salty too, since it was the first time I had some time to get used to it. 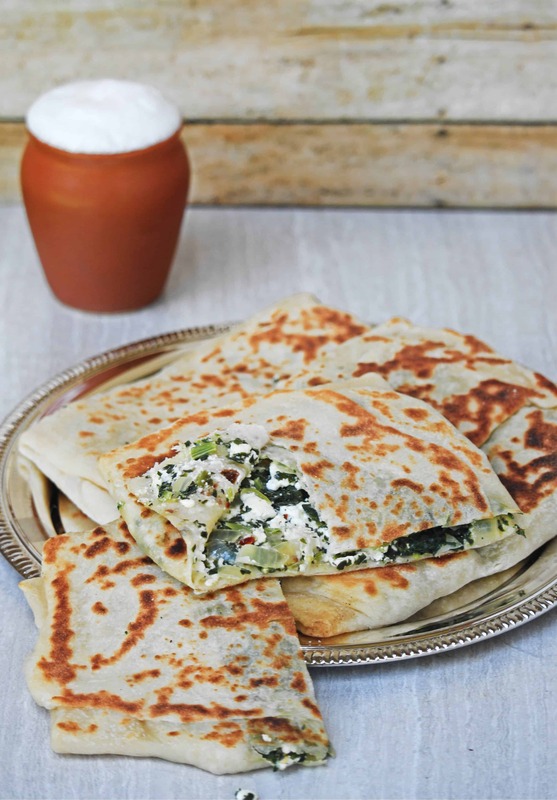 Spinach and feta filling sounds so inviting yaar. 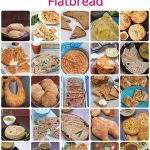 Looks yummy and got me inspired to try out all your flat bread recipes in 2019. Question – can I use whole wheat flour instead of APF? 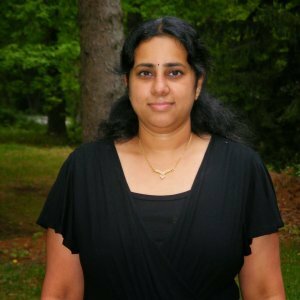 Thanks Aarthi! 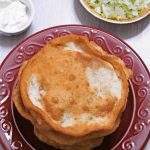 I will not entirely replace the APF with wheat flour as it will change the texture. You could start by using 50 % wheat flour. lovely recipe. Earmarked this recipe to try out very soon! Thanks a lot Ginia! Do let me know how you liked it. I can’t wait to try this amazing recipe! It is explained so well with very good instructions. Thanks a lot Mary Judith! Really appreciate your comment. Do let me know how it turned out when you get a chance to try it. Can you post a gozleme with a meat filling? I am a vegetarian and this is a Vegetarian blog. Sorry, I can’t help you with that. 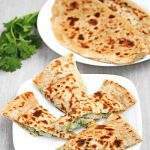 Whenever we are in Turkey, these vegetarian flatbread is our first choice to eat, also at home for the weekend. Loving your step by step recipe pictures. This sounds absolutely delicious. I must make this for my family. Love the flavors and how easy this is to make. So healthy too. Saving the recipe! This would be a perfect snack for me! I love everything spinach! 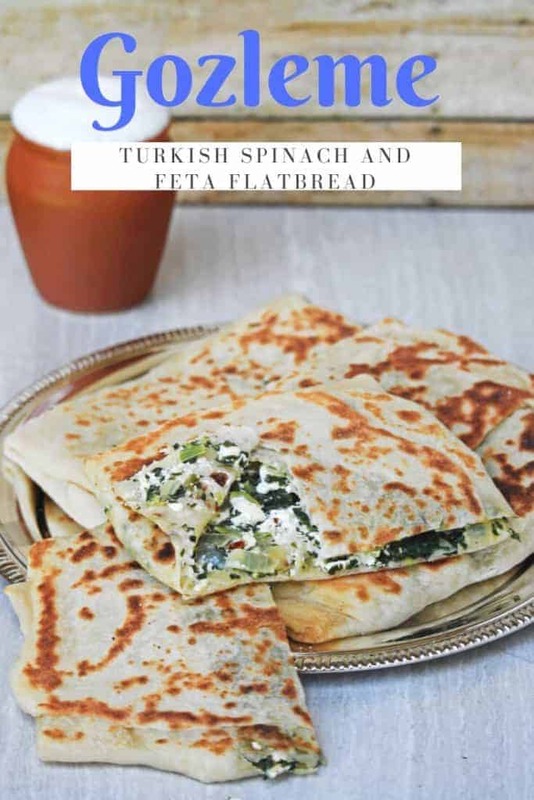 Gozleme looks delicious I love anything with spinach and feta, they are wonderful combo.